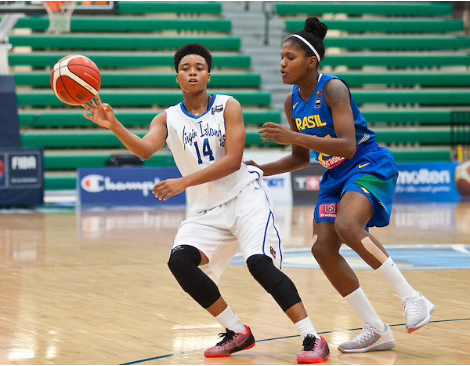 EDMONTON – Considered one of the most powerful teams in the tournament Brazil proved its depth was too much in overwhelming the Virgin Islands 72-58 on Wednesday in the FIBA Americas Women’s Championship at the Saville Community Sports Centre. 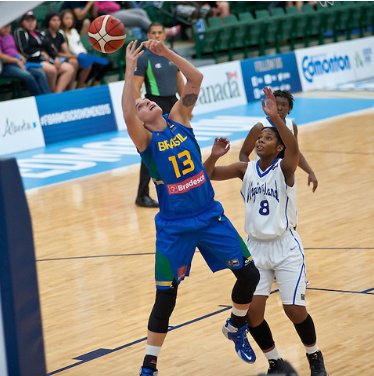 Brazil used its height advantage and quickness to score at will on the Virgin Islands by throwing the ball down into the paint to feed colossal center Nadia Colhado (13) under the basket for easy buckets and allowing her to only play 21 minutes for 15 decisive points in the game. Brazilian point guards Tainá Mayala da Paixao (6) and Izi Castro (8) Marques each had six assists while combining for seventeen points as they learned the secret to their success would be keeping their “bigs” happy under the cylinder including Gilmara Justino (10) off the bench for five points. The Brazilian dominance off the boards was a key factor with Colhado finishing the game with nine rebounds, second only to Virgin Islands captain Victoria Hamilton (14) with 11. Only two players didn’t score for the medal-contending Brazilians, who were not hurt by having 19 turnovers in the game. In the end, Brazil shot 42 percent from the field and the Virgin Islands made 34 percent of the field goals they attempted. Brazil scored 15 points from second chances, but the Virgin Islands only 6 points. The Virgin Islands had the two highest scorers in the game with forwards Natalie Day (6) and Hamilton contributing 16 points each in a losing cause. Virgin Islands, which has never competed before in the FIBA Americas, got here by finishing fourth in the 2014 Centrobasket Championship.